Here’s hoping your 2018 fantasy baseball season has been a success. The final BABS ratings have been posted to the site. With the completion of the fantasy season, it’s time to look back and see how I fared in 2018. In fact, 2018 has been a year I would like to forget. 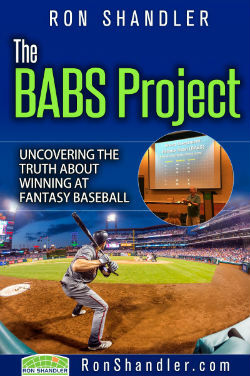 It was a baseball season that yielded my worst overall fantasy performances ever. I took losing to new extremes. I’ll be writing about all the losing in depth in the Baseball Forecaster this winter. Thankfully, BABS was not to blame. She had a good many successes in 2018. 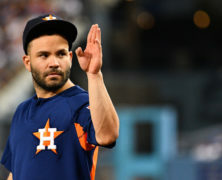 For all her unexplainable disses of Jose Altuve’s (pictured) power and Paul Goldschmidt’s speed, she proved to be on target. For those who used the draft spreadsheets to their greatest utility, some of the counterintuitive players that bubbled up to the top had names like J.D. Martinez, Matt Carpenter, Tim Anderson, Michael Brantley, Ozzie Albies and Mallex Smith. BABS provided her usual spot-on draft prep insights. For me, 2018 was about mental errors, rookie mistakes and distractions. I got cocky on draft day. I took lessons learned about tendencies and drafted as if they were guarantees. I misread the trends and constructed lopsided rosters. It was a mess. I was a mess. I’m not one to make excuses, but real life got in the way this year as well. I had to take over managing the affairs of my 90something parents when my mother was diagnosed with cancer, then had to deal with the death of my younger brother. For those wondering why I disappeared from media appearances, ended my ESPN writing gig early, and then stopped writing entirely, that’s why. I was planning to spend the summer working on several book projects, but forward progress on those braked to about 10 mph. I was able to do some of the research, beginning the process of poring through thousands of emails, document files, paper files, magazine and newspaper clippings to figure out exactly what I have. But writing? I did none of that. What you are reading here is the first material I’ve published in months. So I’d like to put 2018 behind me. But being realistic, my parents are still kicking so I can never guarantee a full return to normality in the short term. What I can promise is that this site will continue to push out valuable content with the focus on your 2019 draft prep needs. Writers Chris Doyle, Pat Cloghessy and several guest analysts helped keep things moving with their excellent BABSian insights in my absence, which confirms my commitment to your success. If you look over the list of features you get with your annual membership, those will all return in 2019. From my years running BaseballHQ.com, I always tried to add something new each year, but I don’t want to over-promise or under-deliver, so for right now, let’s just go into 2019 with the same solid lineup that helped you in 2018. In the interim, I will still be spending my fall working on the 33rd edition of the Baseball Forecaster and manning the microphone at First Pitch Arizona. There are some things I can’t be pried away from. But for now, let’s take this opportunity to take a breath. Hopefully, your home team is still playing this month. Not mine – ha! – but there’s always next year. Good luck with everything, Ron. Take care of family and yourself first. The framework you’ve created with the Forecaster and BABS seems to be in good hands for now. Give real life all your best. The fantasy will take care of itself. Take care. Thank you for all of the content Ron. I am sorry about your 2018 and I hope that 2019 is much better for you and your family. Take care and I will definitely be back next season. Ditto on all the above…take care! Very sorry for your loss and the family distress, Ron. Here is hoping for better times in 2019. I’m really sorry to hear about your personal problems. You definitely had your priorities right, in making certain that you helped your family members in their time of need. Family & reality first our fantasy lives should never take precedent over the needs of others. Condolences, Ron. That’s a lot to handle. I certainly missed your writing, but family is a priority. Here’s hoping your 2019 is a heckuva lot better. Ron, this is second year I used BABS. Learning more about her each year. It was good year for me in each of my leagues (NL only/AL only). Very interested in how BABS will rate minors because out leagues draft 15 round of free agents/minors. Hope the offseason finds you well. Ron you have always been willing to lend an ear whenever I’ve had a chance to talk to you in person . I’m so sorry to hear about all the personal grief and issues that you had to deal with in 2018. Here’s hoping that 2019 will be a kinder, gentler year for you and your family. family issues trump anything in fantasy baseball. Sorry to hear about what life threw at you this year! Thanks to your efforts, in my first year as a BABSian, I won my family and friends league for the 1st time, and I also played in a pay to play yahoo league for the first time, and took home 1st place as well. I also finished 3rd place in one of your sanctioned BABS leagues on Fantrax. My drafts were really strong thanks to the combo of BABS/RotoLab. I basically had a strong foundation from day 1 and just tweaked my teams as the season went on. It allowed to to focus more on strategy. I’m looking forward to next season already! Ron, my condolences to you and your family. You have your priorities correct. Here’s to a better 2019! Thank you all for your kind words. I appreciate it. Happy Canadian Thanksgiving Ron. Wishing you the best and anyone going through lifes challenges. I don’t know what happened to Wilson Contreras though, expected more then I got…although again, he played all year and didn’t cost me any FAB. Eight of twelve owners in my AL 5×5 use HQ so this year I switched to BABS…..totally threw the room off and finished in 3rd which just shows I still have things to learn but it is a great tool to use. Ron, so sorry for your loss, and your family’s struggles. Here’s hoping 2019 brings you better times, both in family matters and fantasy baseball. I had a similar year; sorry about yours. The similarity includes finishing (far) worse in my league than in any other year in the last ten. I think I, too, got cocky with the projections, especially the starting pitching. Back to the drawing board for 2019. Not all the flyers will fly.